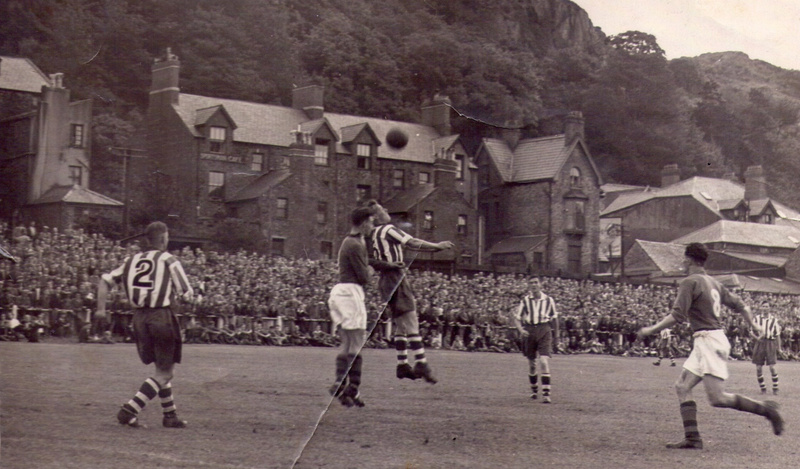 Picture is from the opening match at Farrar Road, Bangor and shows Albion players l-r Chew, Robinson, Cowden & Bowden. The score was 0-0 until well into the 2nd half. This was Bangor's first ever Cheshire League fixture and part of the arrangement was that they paid the additional transport costs from Chester onwards for all visiting teams. Their gate that day amounted to £347 of which they just had to shell out about £10 to cover Albion's return rail fare twixt Chester & Bangor. 20-Sep-1950 CONGLETON TOWN 2-0 2000 WILLIAMS HYDE - p.
13-Jan-1951 WREXHAM RESERVES 2-3 CHRISTOPHER HYDE - p.
17-Mar-1951 ALTRINCHAM 2-0 WILLIAMS HYDE - p.